We’re quickly approaching the one-year mark since we vacationed in the Mediterranean. It seems like only yesterday we were strolling through the streets of Florence and sun-bathing on the deck of cruise ship! If your’e anything like me, you LOVE to travel, but you loathe to pack. It can be an overwhelming task, especially if you plan to travel for over a week! Planning for our Mediterranean cruise was no exception. When it came time to finally stuff my suitcase, I decided that comfort and style had to be the rule. I wanted to look put-together, but not so much so that I couldn’t go casual when need be. Rather than pack 15 different outfits, I needed items that could be mixed, matched and re-worn without looking too repetitive. AND… everything I packed needed to be easily folded away without needing to be ironed once unpacked (I mean come on… I don’t even iron at home)! I found the following items to be the cruise-wear necessities. And they served me well! Check below for current links to my fave’s! 1. A stylish pair of sunglasses. These are a must for any vacation! And Ray-bans are my absolute favorite! 2. A timeless swimsuit. On a fancy cruise, you’re bound to feel a little classy. Just about any all-black suit will do! 3. A floppy hat. Something that makes you feel sophisticated and care-free at the same time. 4. Strappy sandals. Great for exploring the sights or slipping on before you head to the pool deck. 5. A light jacket. You’ll most likely experience fair-weather on your Mediterranean cruise, but if you’re cold-weather-wimp like myself, you’ll want a light jacket on hand. This cargo jacket from Madewell is a personal favorite of mine. 6. A sundress. Pick a dress that is multi-functional! It should be comfortable for the days that you are traveling, able to be dressed up with accessories for fancy dinners, or serve as a bathing suit cover. 7. A flow-y top. What is flow-y you ask? Just the adjective my sisters and I created to describe a shirt that doesn’t cling to you, allowing you to snack as much as you like and still feel cute. 🙂 You will be snacking quite a bit on a cruise, so a flow-y top is necessary! 8. Linen shorts. This pair is both comfortable and stylish. I live in this exact pair AAAALLLL summer! I am a huge fan of lists and list making! (I may or may not be working off of a list to write this post! 😉 ) Maybe you’re not about to embark on a Mediterranean cruise, but if you’re adventure bound – chances are – you’ll need a packing list! You can download my Travel Necessities packing list here for FREE! By now, you’ve probably come across pictures of Havasuapi Falls. The pristine aqua-blue water, red sand, and majestic waterfalls are easily recognizable! I had the privilege of hiking in this paradise last March. Unfortunately, I can’t count it among my 30 by 30 destinations since I’ve been there before. Six times to be exact. I first hiked to Havasuapi when I was ten. My Adventureman has been over a dozen times throughout the years, taking large groups of friends. Last year, we officially launched our adventure business – BG Wild so that we can share one of our most favorite places for years to come! If you’re looking to adventure in this incredible place, then you’re in luck! From a girl who’s been there a time or two, here’s my complete guide to Havasupai! Havasupai Falls is located in northern Arizona in the southwestern portion of the Grand Canyon. It rests on Havasupai Tribal land and is governed by the Supai people. For years they’ve generously allowed tourists to visit their incredible country. It’s a moderate, 10-mile hike to get from Hilltop (the beginning of the trailhead) to the campground. The most strenuous part of the hike is the first mile and a half of switch backs, which traverse at an incline down the face of a canyon wall. The remainder of the hike is lined by the gorgeous, red ribbon-striped rock. 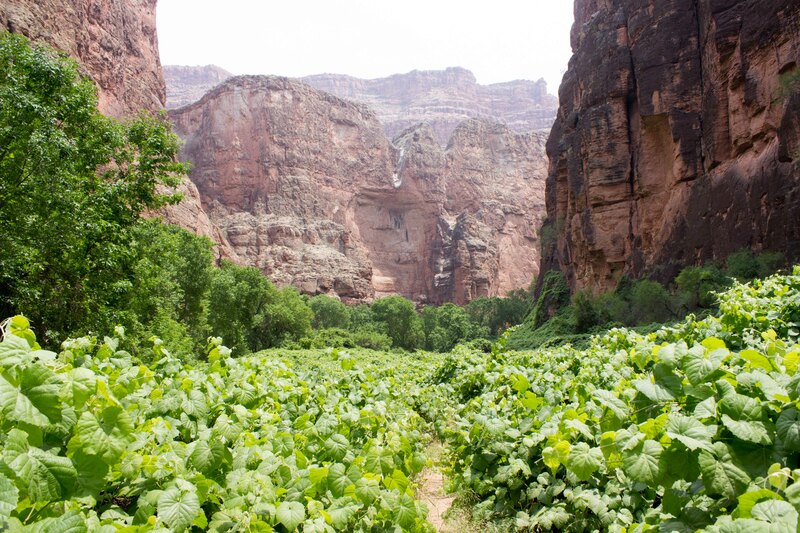 At the 8-mile mark, you’ll reach the Supai village. You should stop at the local restaurant and buy Indian Fry Bread. Trust me, it’s delish! Just when you think that your hike is over, you continue the final two miles to the campground in DEEP red sand. Your burning calf muscles will be richly rewarded as you catch glimpses of the first three falls along the way! The falls are constantly being reshaped by floods and storms. The most recent reshaping took place in a storm in 2008. There are currently 6 falls along the Havasu creek. The first in line is the stunning 50 Foot Falls. The water fans across a tall rock ledge causing vibrant green moss to grow all over it. Although the undertow created by the falls can be strong (CAUTION – NEVER swim directly under a water fall!) the pool surrounding the cascade is calm enough to swim in. If you look hard enough, you’ll find a hidden cave behind one of the cascades! Fifty-foot Falls gets a lot of sunshine and is located about a mere mile from camp. It’s my first choice for swimming and enjoying the sunshine in the beginning of the day! Immediately following 50 Foot Falls are the Navajo Falls. Depending on who you talk to, identifying the actual Navajo Falls can be tricky. The original Navajo Falls dried up following the flood of 2008, causing new falls to be formed with the shift in the creek. Our local Supai friends explained that Navajo Falls is the larger falls to the left and Little Navajo trickles over rocks to the right. Hidden Falls earned it’s name by being off-the-beaten path. You can’t see Hidden Falls from the main trail into the campground, although it quickly follows Navajo Falls. To get to Hidden Falls, you’ll need to wade upstream through gorgeous turquoise water! Havasu Falls is EASILY the most popular sight in Havaupai! And it’s not hard to see why! At Havasu Falls, you can bask in the sun at submerged picnic tables, jump from mini pool to pool, or take a plunge into the surge created by the gushing cascade. Gorgeous Cottonwood trees surround the falls offering shade in the warm season. If you catch them at just the right season (March-April), the breeze will shake cottonwood seeds loose from the trees giving the falls a truly magical look! Mooney Falls is an adventure-lover’s DREAM. You’ll be awe-struck and speechless the first time you see this 200 foot beauty! The falls is located at the end of the campground. You can view it from above, however actually hiking down to it is not for the faint of heart! First, you’ll pass this forbidding sign. Then you’ll squeeze into the tunnel pictured on the right. As you exit the tunnel, you catch your first magical glimpse of Mooney! Trust me. The view is worth the climb! If you’ve made it down to the base of Mooney, then you’re a third of the way from the campground to the final falls – Beaver! Hiking to Beaver Falls is probably one of my most FAVORITE parts about Havasupai. The three-mile trek is green and turquoise oasis. You’ll feel like you’re an explorer discovering a new land! … and pass through a seemingly endless field of vines! After a long hike, it’s time to reward yourself with a swim at Beaver! Cliff jumping is a must try! Havasupai Falls has become a major hotspot in recent years. To visit the falls you must purchase a permit and camping reservation – no day hikes allowed. Depending on how you choose to book your reservations, obtaining hiking permits can be almost impossible! There are only two ways to reserve a spot: you can either book individually through the Supai tribe or do so through a licensed outfitter/guide. Whether you go individually or with an outfitter, you’re in for a great experience. Here are the pro’s and con’s to either choice. It’s affordable! A three night stay is only $150 per person. Flexibility. When you travel with an outfitter, you may have to adjust your desired travel dates and itinerary based on when your outfitter has scheduled trips. If you’re planning your trip on your own, you have the flexibility to build your own adventure. It’s nearly IMPOSSIBLE to book a spot. As I mentioned earlier, Havasuapi has become hugely popular in recent years. With only 300 camping spots available per night, your chances of booking on your own diminish quickly. In February of every year, the tribe opens up their phone lines to accept reservations. Their phones are ringing off the hook for days on end with no call waiting or “sorry – we’re sold out” messages. Usually the tourist office sells out of spots for the entire year within 3 days. Booking on your own can be a frustrating and anxiety-filled experience! Even if you do get through, you may not be able to get the number of spots or the dates that you were hoping for. Rugged, but not relaxing. Yes, traveling in “beast-mode” can be quite an accomplishment, but it’s not relaxing. After an exhausting 10-mile trek, you’ll have to set up your camp and get dinner started. And, since there’s no fire permitted within Havasupai, your dinner will probably consist of granola bars, beef jerky, and fruit. It’s possible to send grills and other heavy gear down on the pack mules for an additional charge, but we don’t recommend that. The 10-mile trek is very harsh on the animals. We can GUARANTEE you a reservation! The tribe designates a small portion of their reservations each year for outfitters. This means that even after individual spots have sold out in February, our spots remain locked in. We take care of your permits and reservations so that there’s no hassle or headaches for you! We’re the most affordable outfitter. Our trips aren’t as cheap as when you book individually, however we beat out the competition by several hundred dollars. Our goal is to keep our trips as affordable as possible. We honor and respect the Supai, their land, and their animals. Over the years we’ve developed relationships with many of the Supai people. We consider them friends. We’re grateful that they allow us to visit their land and seek to abide by their rules to help them maintain the falls for generations to come. We also care deeply about their pack animals. To date, we’re the only outfitter that pays additional fees to transport our food and gear by helicopter to the village, rather than on the backs of the mules. Our food is incredible! Since we’re able to helicopter our gear down to the village, we can provide a pretty extraordinary spread! No granola bars and beef jerky here. We’re talking steak, lobster mac and cheese, pancakes, and more! We offer massages and yoga. Yup! You read that right! We bring along professional massage therapists and yoga instructors on our trips. Because, why not? Our guides are fun, outgoing people. We hire our friends – the people we know and trust to be fun, outgoing, inclusive, and knowledgeable. We guarantee that you’ll love them! At this point, BG Wild travels to Havasupai seasonally. We only take trips at the most optimal times of the year (March – May and September – October) and typically on the weekends. We’re often asked if we can change our dates or book additional trips, but since we pre-book our spots like the general public – we’re not able to make changes once our spots are set. We’d be honored to show you Havasupai! It’s truly an unforgettable place. Registration for our 2018 trips is NOW open! Rome has been on my bucket list since high school! I fell in love with the ancient city reading history text books and watching classic black-and-white movies. I could hardly wait the full two weeks of our Mediterranean adventure to meet it’s finale in Rome! Undeniably, Rome is incredible. While you’re sure to fall in love with this city, it’s important to note that there are ways that you can either enhance your Roman holiday or seriously hinder it. Here are a few of the DO’s and DON’Ts you’ll want to keep in mind for your visit. DO throw a coin into the Trevi Fountain, but DON’T expect to get a killer picture of the moment. The Trevi Fountain is easily one of Rome’s most iconic attractions! The first thing I did once we dropped off our bags was dig out a coin from my purse and practically drag my Adventureman through the cobble stone streets until we found the fountain. It was awe-inspiring for sure, but SO CROWDED! People were standing shoulder-to-shoulder just to catch a glimpse of it. Maybe you’re like me and you envision the perfect photo op that makes it seem like you have the fountain to yourself as you make a wish! There was no such moment for me! I made a heroic attempt, but as you can see, not everyone in the frame was ready for the picture! DO pay for a joint tour of the Colosseum, Roman forum, and Palatine Hill. Some of Rome’s most popular ancient ruins include the Colosseum, Roman forum, and Palatine Hill. While the Forum is free to walk through, the Colosseum and Palatine Hill require an admission fee. We chose to pay for a 3-hour guided tour that included exclusive access to all three attractions and we are SO glad that we did! With an all-inclusive guided tour, we were able to schedule our day and skip the lines to enter each area. Rather than walk through the ruins on our own and have to guess what each ancient structure once was, we were given a full explanation from a history expert. By far the best perk of our guided tour was the special access it granted us within the Colosseum. Inside the Colosseum there are many different viewing platforms. General admission only grants you access to a few of these spots. Our tour allowed us to enter all viewing areas: the top of the amphitheater, the area encircling the arena, and the underground maze beneath the arena. DON’T walk out onto the Colosseum arena (or maybe do… just don’t get caught). I had high expectations for the underground portion of our Colosseum tour. I fully assumed that we’d be permitted to walk among the center ruins – right beneath where gladiators once fought. Much to my bitter disappointment, we were only allowed to look across the ruins from under the eaves! At the same time our tour was taking place, a group of archaeology students in yellow hard hats explored the center area at their leisure. I frantically looked for a discarded hard-hat in hopes of impersonating an Indiana Jones in training. No such luck. But if you should find yourself in possession of such a hat… you have my blessing! Just don’t get caught! DO pre-book your small group Vatican tour. Visting the Vatican is NOT overrated! There is so much to see. We opted to pre-book a small group tour of just our group of six. One of the best decisions of the trip! Like with the Colosseum tour, we were able to schedule our tour time, skip the enormous line, and be guided by a genuine expert. Our guide took us through the Vatican museums, the former pope’s apartments, the Sistine Chapel, and finally to the breathtaking St. Peter’s Basilica. DON’T eat in the tourist hotspots of the city. Just don’t. The food is overpriced and very Americanized. You’ll miss out on the authentic Roman flavor – sadly, like we did! You will inevitably need to eat in a tourist area, because.. well … you are a tourist checking out the sights and you will be hungry! But do your research and find out the hidden culinary gems that Italy is known for! If you find yourself in a restaurant packed with locals, you know that you’re in the right place! DO rent a place using VRBO in Rome’s Centro Storico neighborhood. We were so glad that we opted to stay in a home for rent over a hotel or hostel! Our house was situated in the heart of the Historic Center, just a few blocks away from Trevi Fountain and the Pantheon. The house was beautiful, private, and surprisingly affordable when compared to nearby hotels! We felt like locals in one of the tourist capitals of the world! For years I imagined that I’d honeymoon in Rome. In hindsight I’m glad that we didn’t. Honeymoons are for privacy and relaxation, but Rome is for active exploring. Sure, it’s a city of romance, but I couldn’t imagine experiencing it any differently than with four of our dearest friends!